Philosophers busts placed on the terrace of Achillion palace, Corfu, Greece. Philosophy and Modern Languages brings together some of the most important approaches to understanding language, literature and ideas. The study of philosophy develops analytical rigour and the ability to criticise and reason logically. It allows you to apply these skills to questions ranging from how we acquire knowledge and form moral judgements to the nature of language, art and literature. Since many works of literature are shaped by the dominant philosophical ideas of their epoch, study of philosophy can illuminate that intellectual background. The study of a modern European language develops analytical and critical abilities as well as highly competent linguistic skills. Studying the literature written in that language contributes to an understanding of many aspects of European culture, enabling students to develop attention to stylistic and terminological detail and rhetorical strategies, and sensitivity to cultural and historical context, all of which are of great value to the study of philosophy. Studying these two disciplines in parallel has numerous advantages and affords students greater insights into each. 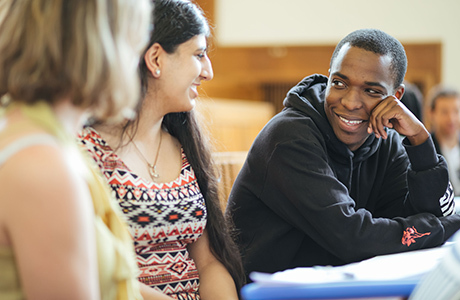 The Philosophy Faculty is the largest philosophy department in the UK, and one of the largest in the world, admitting around 450 undergraduates annually to read the various degrees involving Philosophy. Many faculty members have a worldwide reputation and our library and other facilities are acknowledged as among the best in the country. Oxford’s Modern Languages Faculty is one of the largest in the country, with a total intake of more than 250 students a year, including those reading joint degrees. The Taylor Institution is the biggest modern languages research library in the UK. The Modern Languages Faculty also has an undergraduate lending library, and students are able to take advantage of the well-equipped Language Centre. Modern Languages students spend a compulsory year abroad, usually in the third year. You may work as a paid language assistant in a foreign school or do an internship abroad, both of which provide valuable opportunities to develop career experience while improving language competence. Alternatively your year may be spent studying at a foreign university. You will also be encouraged to spend as much of your time as possible during the vacations in the countries whose languages you are studying. In addition to the possibility of Erasmus funding, extra financial support, including travel scholarships, may be available from your college and/or the faculty. Your work will be divided between one or two tutorials and about six hours of lectures each week, in addition to about two or three hours of classes (first-year logic, language classes throughout the course). The rest of your week will be spent in independent study to prepare essays for tutorials and improve your command of your language. Tutorials are usually up to four students and a tutor. Seminar and language class sizes may vary depending on the options you choose or the language you are studying, but there would usually be no more than around 20 students and would often be much smaller. Most tutorials, classes, and lectures are delivered by staff who are tutors in their subject. Many are world-leading experts with years of experience in teaching and research. Some teaching may also be delivered by postgraduate students who are usually studying at doctorate level. To find out more about how our teaching year is structured, visit our Academic Year page. The options listed above are illustrative and may change. More information about current options is available on both Philosophy and Modern Languages websites. Essential: Candidates would usually be expected to have the language or languages to A-level, Advanced Higher, Higher Level in the IB or another academic equivalent unless applying for a beginner's course. For Philosophy: candidates are not required to have any experience of studying Philosophy though some background reading is highly recommended. For Czech, Italian, Modern Greek and Portuguese: Please note there are different course codes for these languages, depending on whether you are applying with an A-level or equivalent in the relevant language, or if you are applying for a beginners’ course. Beginners’ courses allow students to start studying one of these languages from scratch. All candidates must take the Modern Languages Admissions Tests (MLAT) as part of their application. Candidates will need to take two sections of the MLAT: one for their chosen language, and one for Philosophy, see here for further details. Separate registration for each test is required and it is the responsibility of the candidate to ensure that they are registered for these tests. We strongly recommend making the arrangements in plenty of time before the deadline. Everything you need to know, including guidance on how to prepare, can be found on the MLAT page. Description: Candidates must submit the same written work as required for Modern Languages, please see Modern Languages for further details. The piece of written work submitted in English may also be seen by philosophy tutors, so it should show your capacity for reasoned argument and clear writing; a good length would be between 1000 and 2000 words. Most candidates will not be studying philosophy, so there is no expectation that it will be on a philosophical topic. For more information, and to download a cover sheet, please see our further guidance on the submission of written work. At interview, tutors will be looking for interest in the proposed fields of study, relevant linguistic ability, a critical and analytical response to questions and/or texts and the ability to defend a viewpoint by reasoned argument. For further information about the selection criteria for this course, please see the Philosophy and for Modern Languages websites. Philosophy and Modern Languages graduates enter careers including academic teaching and research, teaching, commerce, banking and financial services, journalism and communications. The analytical and reasoning abilities gained from a degree in Philosophy, combined with the communicative skills gained in a degree in Modern Languages, make graduates highly employable in a global field. Home/EU/Islands students: £1,385 for the year. International students: £8,415 for the year. We recommend that students begin to research their year abroad options – including the financial implications – as early as possible in the second year of the course. There is plenty of support, information and advice to help you. You may choose to work or study during your year abroad, or you may do both. Students undertake a range of activities while on their year abroad, some activities may receive a salary and thus - depending on individual choices - it is possible for the year abroad to be cost neutral. Actual costs (such as course fees) and living costs will vary depending on the destination and the activity undertaken. You will need to pay for living costs during the year abroad, including accommodation and travel expenses. Subject to the UK continuing to be eligible to participate in the Erasmus Programme after leaving the EU, students taking part in Erasmus study exchanges will not need to pay course fees to other institutions. However, if you decide to study outside Erasmus you will be liable to pay course fees to the relevant institution. You may receive salary payments or grants to offset some or all of these costs. Also, if you receive government funding for the rest of your course, you will still be entitled to government support during your year abroad. Hardship funds are available from the Faculty of Medieval & Modern Languages for students who can demonstrate particular difficulties related to their year abroad. These are awarded through a termly application process. Click on the UCAS code list below to see KIS data for each subject option. Please see the Erasmus page for details of opportunities for this course. Students interested in this course might also like to consider other Language courses, or Philosophy and Linguistics (part of PPL).